Edward P. Yim, Esq, Associate Director, Department of Energy & Environment, D C provided a summary of the DOEE's efforts to develop energy systems that facilitate deep de-carbonization across the District over the next 15 years. Critical to this plan is understanding locational behavior of consumer peak demand across the District. Mr. Yim pointed out that DC congestion charges between 2010-2012 were an estimated $120M. Jorge Camacho, Office of Infrastructure and System Planning, PSC D.C. reviewed the progress to date of the MEDSIS Working Group and highlighted the importance of understanding the possible contributions and limitations of renewable generation. Scott Pomeroy, Director of Sustainability Initiatives, DowntownDC BID outlined the current efforts underway by many of the largest real property owners in the city to best optimize their energy consumption. The DC Business Improvement District, on behalf of key commercial RE electric consumers, has been actively addressing in the environmental, cost and reliability aspects of energy for several years. A current key focus is developing a virtual building monitoring and control platform that can act in a collaborative manner with PEPCO, PJM and its members. Michael Herbert, Energy Industry Analyst, Federal Energy Regulatory Commission highlighted AD16-20-000 where FERC issued data requests to the RTOs/ISOs as well as a request for comment to industry specific to storage. In RM16-12-000/RM15-21-000, FERC recently (May 13, 2016) held a technical conference on interconnection issues, with interconnection issues related to storage as a piece of it, and solicited post-conference comments on specific issues. Also in attendance was Scott Baker of PJM who provided a summary of the upcoming (2018/2019), year-round requirements for participation in the PJM Capacity Performance program and key reasons for the change, namely the exorbitant costs incurred from the Polar Vortex of 2014, where PJM billed $11Bn in one month. A key point of consensus was the desire to focus our collaborative efforts around a worthwhile goal comprised of specific, measurable outcomes. 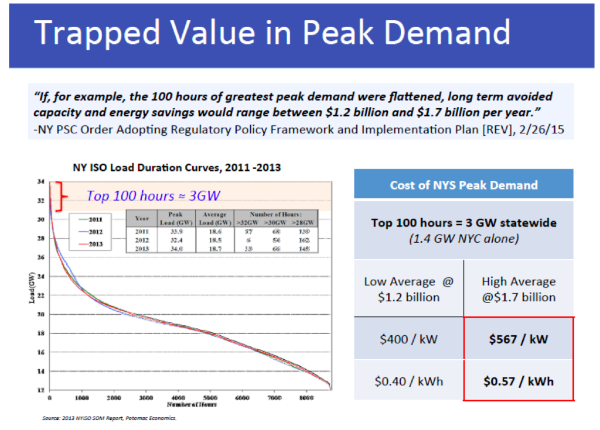 Recently, the NY PSC concluded that reliable delivery of electricity for the top 100 hours of the state's load duration curve costs up to $ 1.2 - $1.7 billion dollars per year. As a quickly growing, geographically constrained load zone, significantly reducing the District's Peak Demand, specifically over the top 100 hours of peak consumption appealed to many stakeholders as a high priority, high value goal that would benefit the majority of stakeholders. The upcoming Washington Advanced Energy Stakeholders Breakfast continue its focus on the Top 100 Hours Initiative plus Technology, Buildings and Distributed Energy Optimization. Request an invitation to join the next breakfast here. Older Post2016 NYAE Q2: Generators as DERs?